Maureen Edobor ‘17L, from Dallas, is a graduate of the University of Texas. Before attending law school, she worked as a national field fellow for the Alliance for Citizenship, an organization that promotes fair immigration reform. 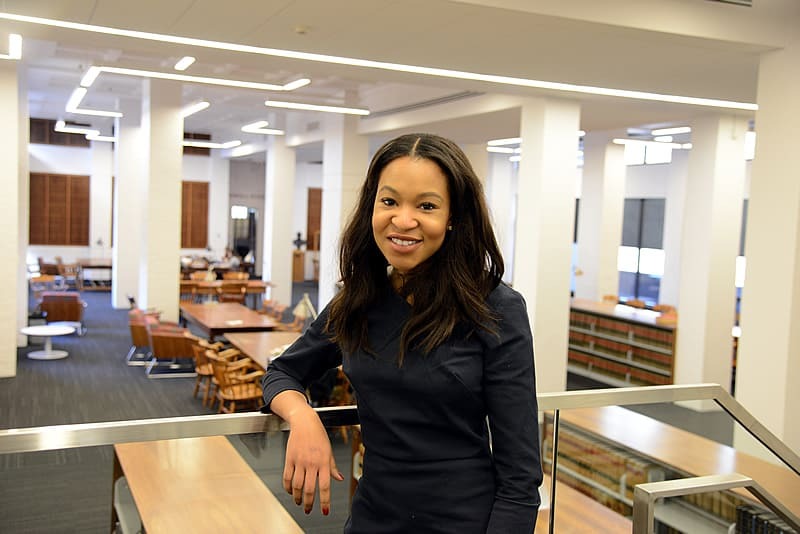 This year, she is serving as the attorney general for the National Black Law Students Association. In this Q&A, Edobor talks about how she got involved with BLSA and pursued a leadership position at the national level. When did you first learn about BLSA? I actually had not heard about BLSA until I was admitted and the admissions office put me touch with a current student, Hernandez Stroud ‘15L. I knew W&L was a great law school with successful alumni all over the country, but knowing there was this affinity group I could be a part of was really important in my decision to attend W&L. I didn’t get that kind of connection from any other school. What role does BLSA serve at W&L? BLSA is an organization that strives to create culturally responsible and academically adept law students who can go out and do great things in the community. On the campus level, we provide mentoring to new students about academics and career opportunities, and we also plan social events. In addition, we encourage students to get involved with the regional and national organization through community service projects as well as moot court and mock trial competitions. Teams from W&L have made the national finals every year since we began competing, and we were the 2015 national champions in mock trial. Next month we will send two mock trial and two moot court teams to the regional competition in Pittsburg and then hopefully on to the national finals in Houston. How did you get involved with NBLSA? When I was a 1L, my mentor Jasmine Brooks ‘15L encouraged me to apply for a position with the national organization. I was named the Virginia sub-regional director and basically served as a liaison between all the BLSA chapters in Virginia, planning community service projects and an academic retreat for 1Ls. I decided to run for the national office of attorney general the next year because I felt it would a great professional development opportunity. Many of the law students to hold this position go on to advocacy careers on Capitol Hill, which is my ultimate career objective. I ran against three other people for the position, and in addition to filling out a lengthy application, I had to give a speech and participate in a debate at the national convention. What projects have you worked on as NBLSA’s attorney general? The attorney general is basically the advocacy voice of organization. I have worked on policy statements about issues that are important to black community, and I coauthored an amicus brief to the U.S. Supreme Court in Buck v Davis, a case involving racial bias. I planned panel discussions for the Congressional Black Caucus convention and press conferences in conjunction with national executive board meetings in different cities. I have also worked on several public comments to regulatory bodies on such issues as the new ABA rule on bar passage, wireless availability in public housing and raising the age of majority. The position covers a wide swath of areas and requires a tremendous amount of work. What are your plans following law school? I am currently in the running for two fellowships, one with a criminal justice reform organization in St. Louis and another with the Poverty and Race Research Action Council. I have also accepted a judicial clerkship with Judge Pam White ‘77L in Baltimore City Circuit Court. I am happy to have options.